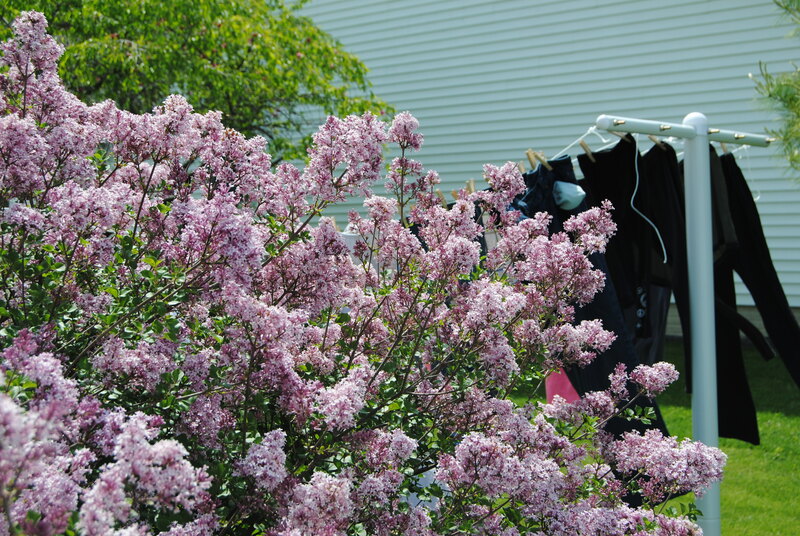 Just beyond my lilac bush, which has bloomed beautifully despite the horrible winter and crazy spring. Just a few short steps past my lilac bush which sends a wonderful scent of fragrance thru the air. If I open my kitchen window, the scent wafts into the house. Ahhhh!!! Now I know you see it. I finally have a new clothes line!!!! I had one many years ago. It wasn’t the best, but it worked for a couple of years until we finally took it down. It wasn’t installed property and began to sag, posts tilting in and the cross-bar loose and falling off. A few years later we replaced it with one of those umbrella style clothes lines. That one served it’s purpose for a few years and when it kept collapsing under the weight of clothes, I knew it was time to go. Finally, over the weekend, hubby (with the help of Lili) installed my new clothesline. I’m in laundry heaven!!! Clothes flapping in the breeze. My dryer getting a rest. It’s awesome!!! I would love to have a clothesline, especially since our dryer has been out of commission for about 3 months, but Matt won’t let me have one cause we live in town. Congrats on your new line, bet the clothes smell really good after being wafted with that beautiful lilac bush. You are so lucky! So Matt doesn’t want the neighbors to see his clean underwear flapping in the breeze? LOL!!! And how are you drying your clothes if your dryer is out-of-commission? I’m excited for you!! It is a must for every homesteading mama. And next to the lilacs is a bonus! Doing laundry is one of my favorite household chores. Having a clothesline makes it even better!! We lived in Germany for 3 yrs back in the 80s. Most people there then had Landry lines or racks on their balcony. Almost every apartment has a small balcony, and our had 2. One balcony had a few lines, and we found several racks in the “spermull” . Spelling may be wrong there, but that is how the word sounds. This was the once every 3 months large trash pick up. We found things of use, for free this way often. Think of it as German style dumpster diving. We were broke lower enlisted with 3 kids in the beginning, 5 by the end of the 3 yrs. We put these racks out on balcony in summer, inside in winter. This was the way we dried all our laundry the entire time we were there, excepting the year we had a dryer, also found in the spermull. When it died, we hauled it back out for next spermull pickup. We lived in Ukraine for a month while adopting from an orphanage there. It was winter, with spring coming. We dried our clothes on the radiators, after washing them in the bath tub. I knew how to dry on the radiators, from having had 2 children in cloth diapers for most of our time in Germany. When I got behind washing diapers, and needed one faster than line drying was happening, I hung a few over the radiators. I was thankful for those radiators. Toward the end of our stay in Ukraine, the radiators were turned off. Not because it was warm out, although that was coming, but because the date on the calendar was the date that the radiators in state owned apartment building are turned off every year. I own 4 laundry racks now, and they get used whenever the dryer is awaiting repair, or replacement. 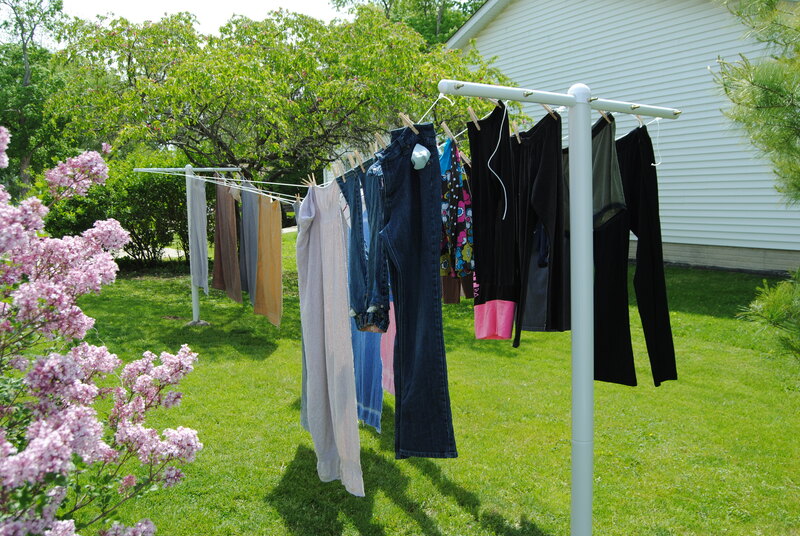 To me, a good sturdy outdoor laundry line is an asset that I want to have at my next house, even though I am aware that there are 3 indoor racks, suspended from the ceiling already there waiting for me. I have 3 retractable clothes lines in my laundry room. I bought them for hanging cloth diapers in the winter. They don’t hold a lot, but have come in handy on several occasions. Still nothing compares to clothes hung outside to dry in the sun and wind. Ahhh!! !